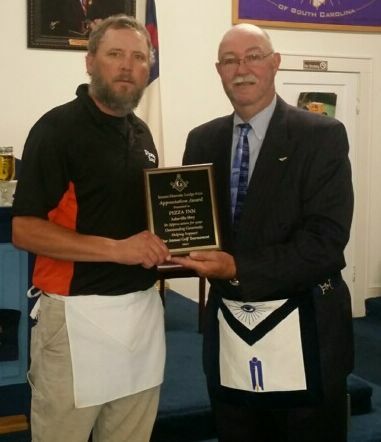 Brother Rusty Aker being presented a plaque from Inman Masonic Lodge by Brother Stephen Parris. Before the November regular communication, Brother Stephen Parris presented Brother Steven Lane "Rusty" Aker with a plaque as a small token of appreciation for the support that Pizza Inn has shown Inman Masonic Lodge. Brother Aker, a member of Gaffney Masonic Lodge #186 AFM, along with his brother Daven, are owners several Pizza Inn locations in the area, most notably on Asheville Highway in Spartanburg, SC. These two men have made Pizza Inn the biggest contributor of Inman Masonic Lodge's annual golf tournament for two years in a row. Thanks to the Aker brothers and Pizza Inn for their support!